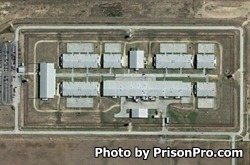 Middleton Transfer Facility is a medium custody prison located in Abilene Texas that houses G-1 minimum to G-3 medium security offenders and those classified as transient. Transient offenders are inmates who are either being held while awaiting trial or are temporarily being held at this location while awaiting a more permanent facility assignment. Middleton Transfer Facility is designated as a intake and transfer facility for male offenders that also serves as a confinement facility for youthful offenders. Middleton Unit sits on 402 acres of land and is co-located with Robertson Unit. The current housing capacity for Middleton Unit is 2,128 offenders. Middleton Transfer Facility is secured by double chain linked fences covered with razor ribbon wire and four armed towers. The prison is comprised of ten buildings which are mostly dormitory styled housing units. Educational programs offered at Middleton Unit include adult basic education, literacy courses, GED testing, and pre-release courses that prepare offenders for an upcoming discharge. Substance abuse treatment, support groups, parenting classes and life skills courses are also available. Select offenders are permitted to work within Middleton Transfer Facility providing unit maintenance, and working within the facilities garden. Additionally, some inmates are allowed to care for security horses and canines while others are permitted to work in community projects providing a supervised labor force to local government agencies, the Texas Department of Transportation and giving lectures to local school districts. Inmates at the Middleton Unit are allowed visitation on Saturdays and Sundays from 8am to 5pm. All visitors are required to be on the inmates approved visitors list prior to attending a visiting session. Visits at this facility can be either contact or non-contact (behind a glass partition). The type of visit will depend on your relationship to the offender, for instance if you are a family member you are usually allowed contact visits, friends are restricted to non-contact visits unless authorized by the Warden's office. All regular visits are two hours in duration if space and time permits, special visits for visitors who live over 300 miles away can be 4 hours in duration but require prior approval from the Warden's office. Inmates at Middleton Unit are allowed two adult visitors per visit (anyone under the age of 16 will not count towards the visitor limit). The number of children allowed will depend on the amount of space and the ability of the visitor to keep control of their children during the visit.